Sometimes as an analyst, you put yourself out there and, frankly, you feel like an idiot while you're doing it. You might start off quite convinced in the correctness of your view, but then the market throws a few curves and complicates the pattern -- while meanwhile, most of the other traders you respect are taking the opposite side of the trade from you. Eventually you worry that maybe you're "creatively" interpreting the market to fit your original bias. Your worst fear as an analyst is to lead people the wrong way... so while you personally always trade for the outcome you see as more likely, you sometimes feel the need to back away publicly and give additional airtime to the other side of the trade, so that folks can make their own decisions. At least, that's how I handle it. I suppose I can't speak for everyone. I've said it before, but for me, the hardest part about being an analyst isn't actually the analytic work. It isn't even having to eat crow when I'm wrong. For me, the hardest part, hands-down by a mile, is the fear that I might somehow unintentionally hurt someone. Trading for your personal account (and managing the periodic inevitable losses) is one thing; but feeling like you "caused" someone else a loss is entirely another. I'd rather lose my own money a thousand times than lose someone else's money once. I don't know how brokers and fund managers do it. 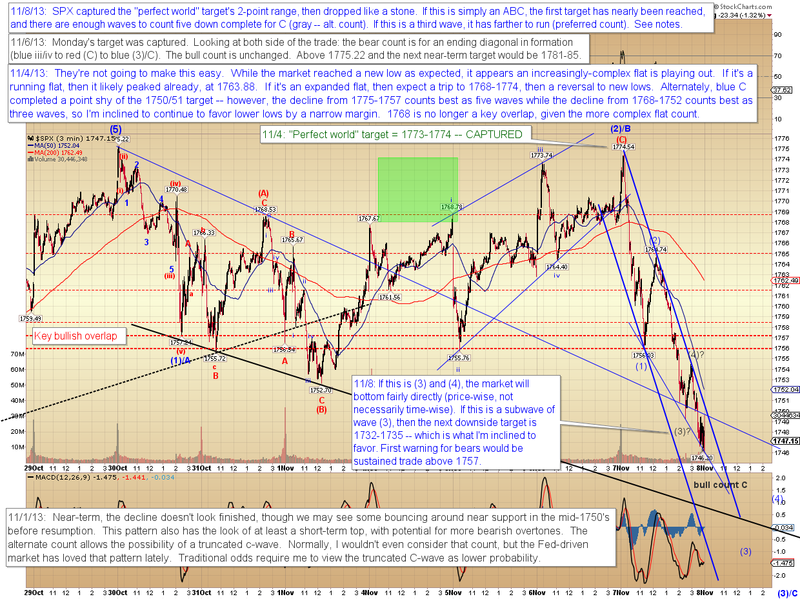 Yesterday the market finally vindicated the preferred near-term wave count in a spectacular fashion, as it reached the very-narrow "perfect world" target of 1773-1774, then reversed straight down to new lows. Score one for the near-term counts, but... The challenge I have with this market at the moment is, frankly, I don't have a strongly-preferred long-term wave count right now -- and I really haven't had one since the 1700's were reached. I'm still slightly leaning toward the bear camp, due to the series of markets which have reached long-term resistance (as outlined over the past week) -- but I'm open to awaiting the market's declaration of its long-term intentions. This is why, from a predictive standpoint, I've been focusing almost solely on the near-term. 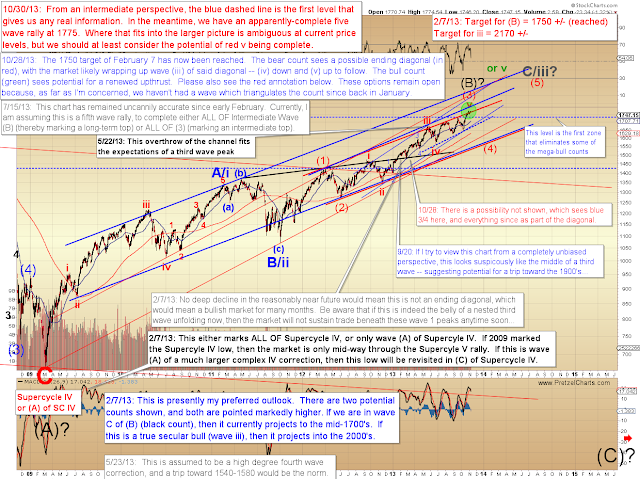 The near-term fractals generally work regardless of the long-term. Where that can get sticky is at points such as right now. If the market's goal was to form a simple ABC (three wave) correction before heading higher, then we basically have enough near-term waves in place for that to happen. However, if we're witnessing a more significant turn in progress, then this decline will go on to become a larger five-wave move. Once that happens, then I'll be able to more strongly favor an intermediate wave count (one five-wave decline would suggest another) -- and then I can fill-in the blanks on the long-term outlook from there. As I've written about for several weeks, this is a major inflection point, and I don't see much in the charts to give either side a strong long-term edge yet. I can say I wouldn't suggest any bullish complacency here, because major inflection points can and do sometimes generate major trend reversals. So, I hope readers don't mind operating inside a long-term vacuum for the moment (just pretend we're inside Bernanke's skull). I'll try to calculate the key near-term levels/targets in the meantime, and we'll worry about the next puzzle pieces as we get there. The reality is, we can only actually trade the present anyway. 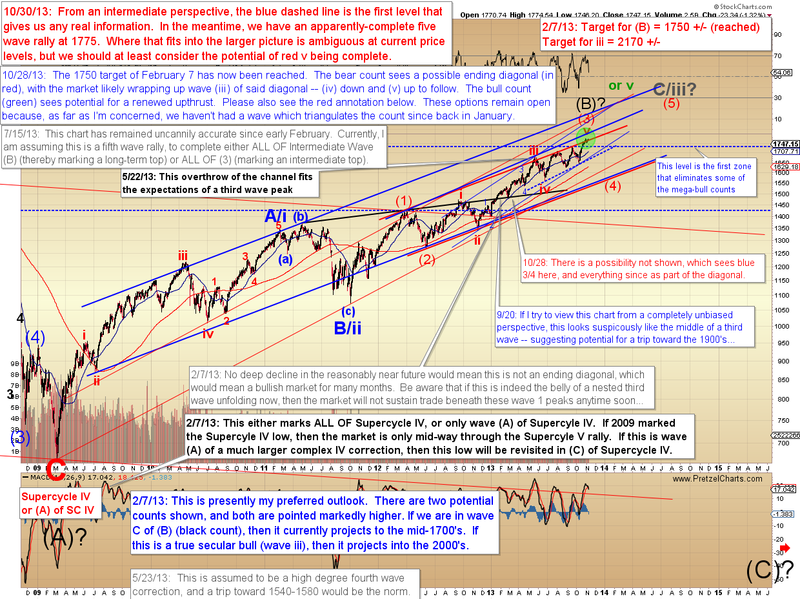 We'll start off with the near-term S&P 500 (SPX) chart. I'm inclined to favor the decline has a bit farther to run, but we've reached the minimum expectations of the count so it's not out of the question for the market to bottom fairly directly. 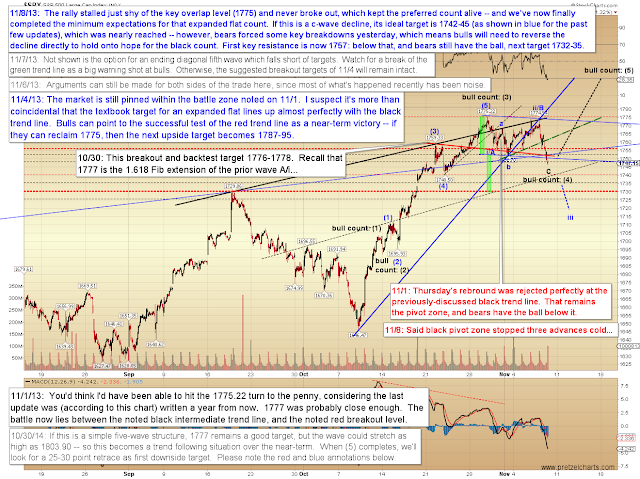 The 30-minute chart shows that important intermediate support comes in near 1730. Important near-term resistance is as noted on the chart above (1757 +/-) -- so that gives us the next two key levels to watch. Finally, the long-term chart, which is unchanged since October 30. 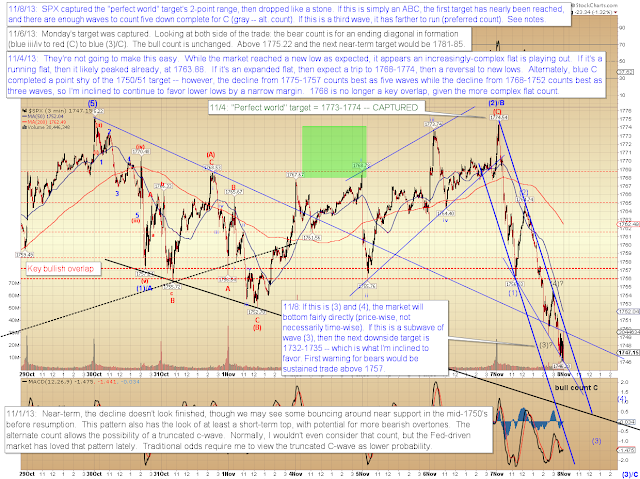 This chart also reveals 1730 as the next key intermediate level. This is because, if we're in a third wave rally, the fourth wave should not overlap the price territory of the first wave -- which in this case is presumed to have peaked at 1730. Don't mortgage the house and go short if we break 1730 just yet, though -- it's still possible we're in a subwave of said third wave rally, which would be "allowed" to overlap the 1730 price point. Again, we'll figure this out if/when we get there. These are just signposts on the road right now. In conclusion, yesterday saw a pretty ugly breakdown; but keep in mind that the first downside targets have effectively been reached, so I'd suggest treading lightly here. 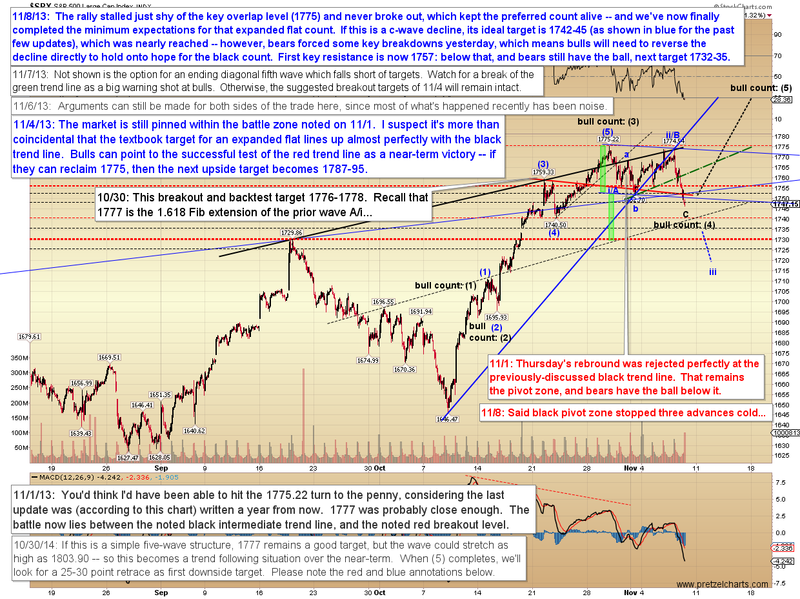 The first step for bulls to right the ship is to reclaim 1757. Trade safe.